Artist/Illustrator Jean Jullien applies his artistry and distinct observations on routine life situations in a delightful children’s board book entitled Before & After. In keeping with the title, this book offers a teaching opportunity through which a young child will learn about chronology, creativity, and outcomes. Jullien’s signature graphic style, cartoonish with bold blocks of color outlined in thick black line, will immediately capture a prereader’s attention. The humorous element in Jullien’s work adds to the book’s appeal. No doubt a child will be motivated to move through the pages. Fortunately, the sturdy board format anticipates this attraction and easily accommodates a young child’s enthusiastic handling. Before & After brings the promise of fun for parent and child. The before and after scenes are thoughtfully conceived while routine enough for a young child to recognize them. Parent and child will enjoy imagining the story possibilities behind the diverse picture pairings. One scenario shows a “Before” of a bedraggled cat dirty and dog-tired followed by the “After” in which same cat is sparkling clean with a contented smiling face. Open to interpretation are the cornucopia of considerations regarding the how, whys, and wheres that explain this cat’s predicament. Another scenario presents a “Before” of a father and son at an amusement park strapped into a car awaiting the start of a roller coaster ride; father is smiling while son appears somber and uncertain. “After” shows the duo following the thrilling ride; father appears to have had the wind knocked out of him while son is gleeful, eyes wide with excitement. The direct experience of Jean Jullien’s artistry is critical to one’s appreciation of it. 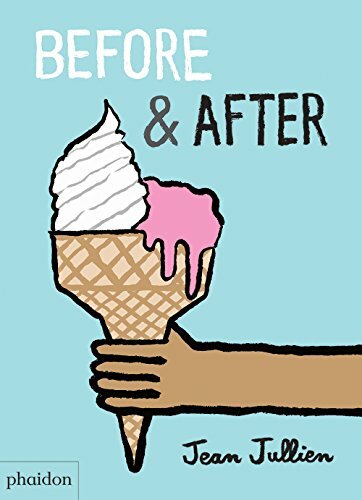 Before & After is uniquely engaging and guaranteed to amuse parent and child alike.